Need to store something but don’t have the space? 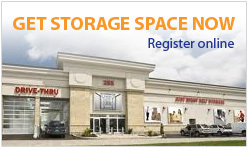 You can store it in our secure, climate-controlled storage centre in Ottawa. Our location is convenient for all commuters as we are centrally located and easily accessible from Gatineau/Hull. We are close to the war museum, O-Train for students, and just off the main transit-way. We offer more storage space than any other self-storage facility in downtown Ottawa. With 24/7 controlled access, state-of-the-art security, professional advice and great customer service, you can’t go wrong! Drive-thru convenience: Park just steps away from your storage unit. Central location: Less than three kilometres from Parliament Hill. Climate control: We control temperature and humidity, ensuring better storage conditions for your goods. Secure building: Controlled access, digital video surveillance, high-quality locks, alarm stations – our state-of-the-art security system gives you peace of mind. Free Truck: We’ll give your goods a free ride when you move them in to our storage facility. Whatever you’re storing in Ottawa, from furniture and possessions, business records, or government storage for files, we’ll make it Just Right! Not sure which size of storage unit you will need? View our different sizes of storage units and learn more about the storage space available in our conveniently located storage facility in downtown Ottawa. You can also use our interactive storage space calculator to get a more accurate selection of storage units based on your needs.